At HiTech Handymen, we are experts in all matters electronic devices. We are the first store in the Chapel Hill area to offer Smart Home services as an addition to typical cell phone and computer repairs. We have been dabbling with the Smart Home devices since it's first inception; we were among the first adapters of Amazon's now ubiquitous Echo devices. And today, we'd like to share with all you wonderful people an ongoing project who've been working on. And off we go! The goal of this first project is to set the stage, the infrastructure for future expansion, so the voice assistants had to be central to this first step. In particular, having Google Assistant and Alexa will cover the vast majority of potential Smart Home expansions. This gives us a good bedrock to work with when we expand their smart home in the near future. 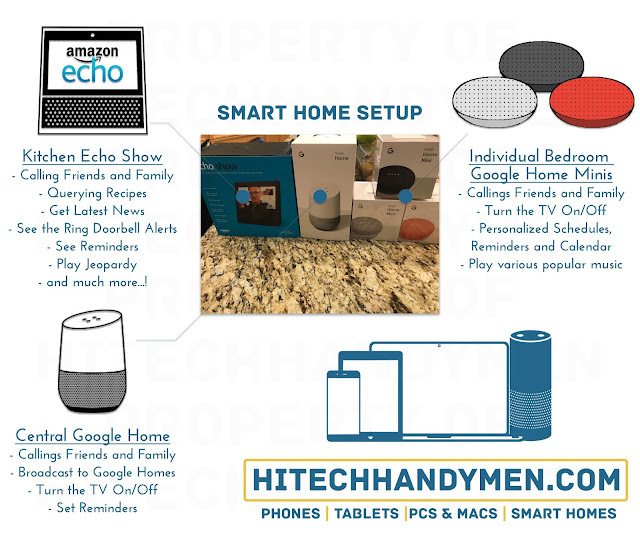 So our setup plan involves placing the larger Google Home in the central area between the kitchen, living room, dining table and piano room. It makes perfect sense with the larger Google Home's ability to hear people from afar. We planned to setup the Amazon Echo Show (the Echo device with a screen) right in the kitchen area, where the family can use it while preparing meals or make calls conveniently. In setting up the Echo Show, we elevated it on one of the mini corner shelves above the kitchen sink and carefully coiled the cables beneath the device to help the presentation. The setup was largely seamless and we let each member set up the Echo Show with their voices. After setting up the individual Google Home Minis in each of their bedrooms, we now have the complete framework for expanding their home! Both Google and Amazon has a wide compatibility with various smart lights, sensors and other smart additions, so it will be much easier to set that up with this framework. Eventually, the goal of the smart home is to get a home that is responsive, smart and utilizes that fancy new smartphone much better. We will update you all amazing people on the second stage of this fantastic project!